With Asus talking about the ZenPad tablets following many similar footsteps as the Zenfone smartphones, we wondered how Asus would roll things out in Canada for ZenPads. The reason for our wonder? In Canada, the Zenfone 2 didn’t make it to most main retailers such as Best Buy. 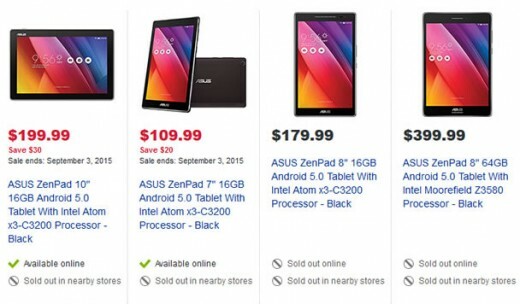 When we saw ZenPad tablets showing up in smaller Canadian retailers first, we wondered if once again Asus was going to “go small” in terms of Canadian retailers. This is not the case which is in our minds, better for the consumer. So we have some pricing here right off the bat, along with ZenPad models in the “coming soon” category. So regarding the hero Z580CA, there is no indicator on possible release date or availability. We’re hoping for new stock updates first thing this Monday morning. Accessories you ask? Like that Audio Dock keyboard for the ZenPad 10? Nope. We don’t see official Asus accessories on BestBuy.ca just yet. So Canadian shoppers, be happy that there will be at least one big retailer shipping ZenPad tablets because it means more price competition. We’re not sure you’re ever going to see the Z580CA cheaper than $399, but it’s always possible. Perhaps you have a Best Buy gift card? Note: We have good information regarding Z580CA backorders and we highly highly suggest you order or pre order one now, rather than waiting. From what’s happened in the US, it’s quite possible that the demand is going to far outweigh the supply. A hunch on our part with a bit of information about the matter. Unfortunately the 8s are off the site again.